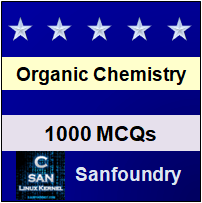 This set of Organic Chemistry Multiple Choice Questions & Answers (MCQs) focuses on “Chemical Properties of Amines – 1”. 1. Which of the following is converted into an alcohol on treatment with HNO2? Explanation: Methyl amine is converted into an alcohol on treatment with HNO2. 2. The action of nitrous acid on ethyl amine gives which of the following? Explanation: The action of nitrous acid on ethyl amine gives ethyl alcohol, along with nitrogen and water. 3. Indicate which nitrogen compound amongst the following would undergo Hofmann’s reaction (i.e. reaction with Br2 and strong KOH) to furnish the primary amine. Explanation: This reaction is Hoffman degradation of amide. R – CONH2 + Br2 + 4KOH → R – NH2 +2KBr + k2CO3 + 2H2O. 4. Aniline reacts with acetaldehyde to form which of the following? Explanation: Aniline reacts with acetaldehyde to form Schiff base. 5.	p-chloroaniline and anilinium hydrochloride can be distinguished by which test? NaHCO3. But p-chloro aniline is basic not acidic it does not liberate CO2. p-chloro aniline does not contain ionic chlorine to it does not give white ppt with AgNO3. 6. Nitroso amines (R2N−N=O) are soluble in water. On heating them with concentrated H2SO4 they give secondary amines. What is this reaction called as? Explanation: Nitroso amines (R2N−N=O) are soluble in water. On heating them with concentrated H2SO4 they give secondary amines, this reaction is called as Liebermann’s nitroso reaction. 7. Ethyl amine undergoes oxidation in the presence of KMnO4 to form which compound? Explanation: Ethyl amine undergoes oxidation in the presence of KMnO4 to form an aldehyde. 8. Reaction of primary amines with aldehyde yields which of the following compound? Explanation: Reaction of primary amines with aldehyde yields aldimines. 9. When primary amines are treated with HCl, the product obtained is which of the following? Explanation: When primary amines are treated with HCl, the product obtained is ammonium salt. 10. Primary amines can be distinguished from secondary and tertiary amines by reacting with which of the following? Explanation: Primary amine reacts with CHCl3 and alc. KOH to form isocyanide while secondary and tertiary amines do not react. 11. When chloroform reacts with ethyl amine in presence of alcoholic KOH, the compound formed is which of the following? Explanation: When chloroform reacts with ethyl amine in presence of alcoholic KOH, the compound formed is ethyl isocyanide. 12. The compound which on reaction with aqueous nitrous acid on HNO2 at low temperature produces an oily nitrosoamine is which of the following? Explanation: The compound which on reaction with aqueous nitrous acid on HNO2 at low temperature produces an oily nitrosoamine is diethylamine. 13. Aniline on treatment with excess of bromine water which of the following? Explanation: Aniline on treatment with excess of bromine water is a nucleophilic substitution reaction and will form 2, 4, 6-tribromoaniline. 14. When an organic compound was treated with sodium nitrite and hydrochloric acid in the ice cold, nitrogen gas was evolved copiously. What is the compound? Explanation: When an aliphatic primary amine was treated with sodium nitrite and hydrochloric acid in the ice cold, nitrogen gas was evolved. 15. Primary amines react with nitrous acid to yield which of the following? Explanation: Primary amines react with nitrous acid to yield Nitrogen. 16. The reaction of HNO2 with ‘A’ gives quaternary ammonium salt. A is which of the following? Explanation: The reaction of HNO2 with trimethyl amine gives quaternary ammonium salt.